Participants in the Pioneers Alliance work to create an enduring legacy of community-based stewardship and conservation in the Pioneer Mountains-Craters of the Moon landscape. One of the jewels of America’s natural heritage, the Pioneers-Craters landscape ranges from sagebrush steppe, grasslands and lava flows to river, foothill and mountain ecosystems, supporting an array of wide-ranging and migratory wildlife. The center of the landscape is a complex mixture of private, state and federal lands, including 150,000 acres of private lands, primarily working farms and ranches. These working lands physically connect large expanses of public lands to the north and south. Currently, approximately 80,000 acres of the private lands in the core area have been or are in the process of being protected through voluntary conservation easements. The roughly 2.4-million acre Pioneers-Craters landscape also includes extensive inventoried roadless, wilderness study and primitive areas managed by the Sawtooth and Salmon-Challis National Forests, the BLM-Shoshone Field Office, and the Craters of the Moon National Monument and Preserve. The region of Idaho that extends from the Craters of the Moon and the northern Snake River Plain to the high peaks of the Pioneer, Boulder and White Cloud Mountains is one of the jewels of America’s natural heritage. Ranging from sagebrush steppe, grassland plains and lava flows to river, foothill and mountain ecosystems, this stunning landscape is brought to life by a diverse array of wide-ranging and migratory species such as pronghorn, sage-grouse, mule deer, and elk, large carnivores including wolves, mountain lions, and black bears, and iconic species such as mountain goats and wolverine. 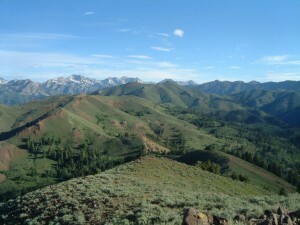 This abundance and diversity of wildlife are supported by the landscape’s dramatic range of elevations over a short distance (from 4,000 feet to 12,000 feet), long free-flowing reaches of rivers and streams and their associated riparian habitats, extensive ungulate winter ranges, and the relatively unfragmented and undeveloped character of the land. Over the past ten years, scientists, ranchers, conservationists and public agency staff have conducted a series of ecological surveys and assessments that now provide us with a solid and rapidly evolving understanding of the region. The ecological significance and wilderness qualities of this region have long been recognized and have resulted in the establishment of over 40 Wilderness Study Areas, Inventoried Roadless Areas, Areas of Critical Environmental Concern and Research Natural Areas. At the southern end of the region lies the Craters of the Moon National Monument and Preserve, established in 1924, with the Craters of the Moon Wilderness Area established in 1970. The Monument was expanded in 2001 by President Clinton from 54,000 acres to 715,000 acres and is now under joint management by the Bureau of Land Management and the National Park Service. While not generally considered a conservation area, the nearby Idaho National Laboratory, a 569,135 acre federal Department of Energy site, includes a 73,600 acre Sagebrush Steppe Ecosystem Reserve and is now understood to support regionally significant wintering populations of sage-grouse and pronghorn. The northern portion of the region lies within and forms the southern edge of the largest complex of roadless areas in the Lower 48 states and includes the Sawtooth National Recreation Area, established in 1972 and managed by the United States Forest Service. The establishment of the SNRA represented a compromise solution that ended a lengthy effort to create Idaho’s first national park; the compromise was built around the desire to protect two Idaho values, hunting and private lands ranching, that are important to our discussion today in the Pioneers-Craters Landscape. The Pioneer Mountains have been considered for Wilderness designation in every wilderness process since RARE II in the early 1980s including in the original versions of Representative Mike Simpson’s Boulder-White Clouds proposals. The middle elevations of the region are characterized by a mix of private lands, state lands, and federal lands managed by the Bureau of Land Management. The middle portion of the landscape consists of about 390,000 acres of working farms and ranches (165,000 acres privately owned) and physically connects the large expanses of public lands to the north and south. These working lands support extensive riparian areas, crucial wildlife habitats and migration corridors, including a 150-mile pronghorn migration route that was recently documented by the Pioneers Alliance for the first time. Protection of these private lands, therefore, is crucial to holding together the entire 2.4 million acre landscape. Currently, approximately 80,000 acres of the private lands in the region have been protected through conservation easements. I must say that, in my opinion, this is one of the most significant private-public conservation initiatives in all of North America. The 3 million acre landscape ranging from Craters of the Moon to the Pioneer Mountains represents one of the most spectacular and biologically significant ecological gradients in western North America. Here is the opportunity for wide-ranging wildlife, such as deer, elk, and pronghorn, to follow natural patterns of seasonal movement, interacting with the key predators – chiefly wolves and mountain lions – that help keep their numbers in check and regulate their distribution on the landscape. There are few other areas in North America where these kinds of natural processes have the opportunity to continue. The advent of rapid climate change makes the conservation of intact elevational gradients, as represented in this landscape, all the more important, as many species will need to adjust their distributions upslope as the climate warms. Cultural and economic activities, especially the herding and seasonal migrations of domestic sheep, paint an even more interesting picture. Here we can study the interactions of cultural and biological activities and empirically discover ways to make them compatible and sustainable – both ecologically and economically.